Bootstrap is an HTML and CSS framework that falls under the ultimate choice of web developers and designers. Of course, for many reasons. It is free, responsive and mobile first. Best of all, it is open-source and is easily adaptable. Originally, it was developed by Mark Otto and Jacob Thornton at twitter to help the developers and was named Twitter blueprint. Later, when the project started to grow along with a number of developers, then it was changed to Bootstrap. Therefore, we sometimes find bootstrap being referred to as twitter Bootstrap. What is WordPress Bootstrap theme anyways? No doubt, there are many benefits of using a Bootstrap WordPress theme. First and foremost, you don’t have to hire designers. Hence, it saves a lot of money as well as designing efforts. WordPress Bootstrap themes also save your time that you had to invest in writing pages long designing codes. Moreover, it speeds up your fresh website development task as it comprises of ready-made coding blocks. It allows creating a prototype of a website quickly and efficiently. Also, it provides a large variety of scripts. And, writing media queries will no more become your headache.Furthermore, this responsive grid-based framework provides assistance to both amateurs as well as professionals. Likewise, it offers you flexibility for customizing the elements in your theme. Above all, Bootstrap combines perfectly with WordPress. It is the main reason why many developers use Bootstrap in their themes. So, here’s the collection of best Bootstrap themes listed by their design, features, and usability. All of these themes are packed with outstanding features. However, some come for free while some cost little amount for the features they offer. Provided that, these themes are best especially when you are operating on a shoestring budget. 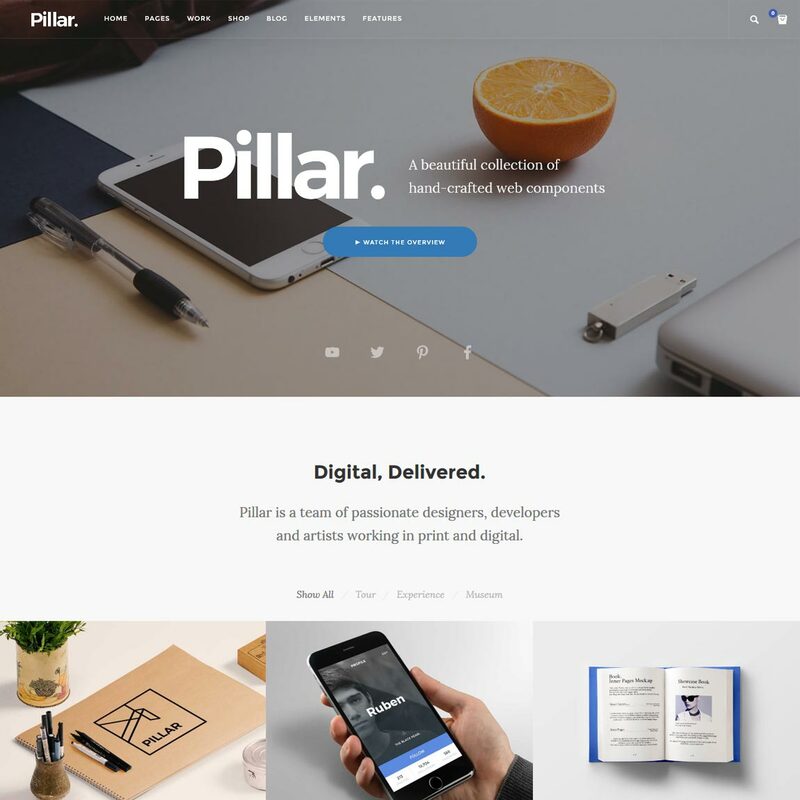 Pillar is a fully responsive multipurpose theme. It is based on modern Bootstrap technology. It is built with over 140 unique blocks. This WordPress Bootstrap theme is power-packed with outstanding features and functionality. If you want to create an outstanding responsive Bootstrap website, then Pillar has your back. With 110 ready to use demo pages, 26 home pages, 160 sections given you can easily create multipage or single page websites in no time. Its versatility allows you to create a website of any kind- personal resume to corporate websites and business landing pages. Moreover, it offers you wide range of header, footer and Google font options. That is to say; it provides countless styling options for your websites. 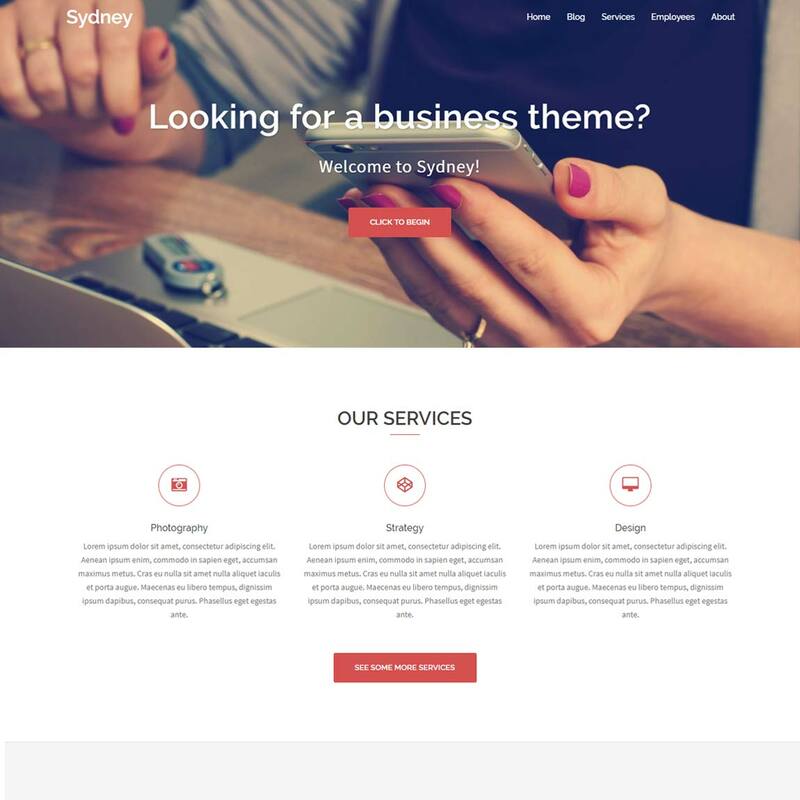 Sydney is a top-notch business theme based on Bootstrap framework. By far, it is one of the most popular and highly-rated themes in wordpress.org. This free WordPress theme assists every company in building their strong online presence. This theme is bundled with plenty of customization possibilities. Parallax backgrounds, full-screen sliders, unlimited theme customization options are some of its notable features. This theme allows you full-color control with unlimited color options. Translation ready feature helps you reach out to your global audience. 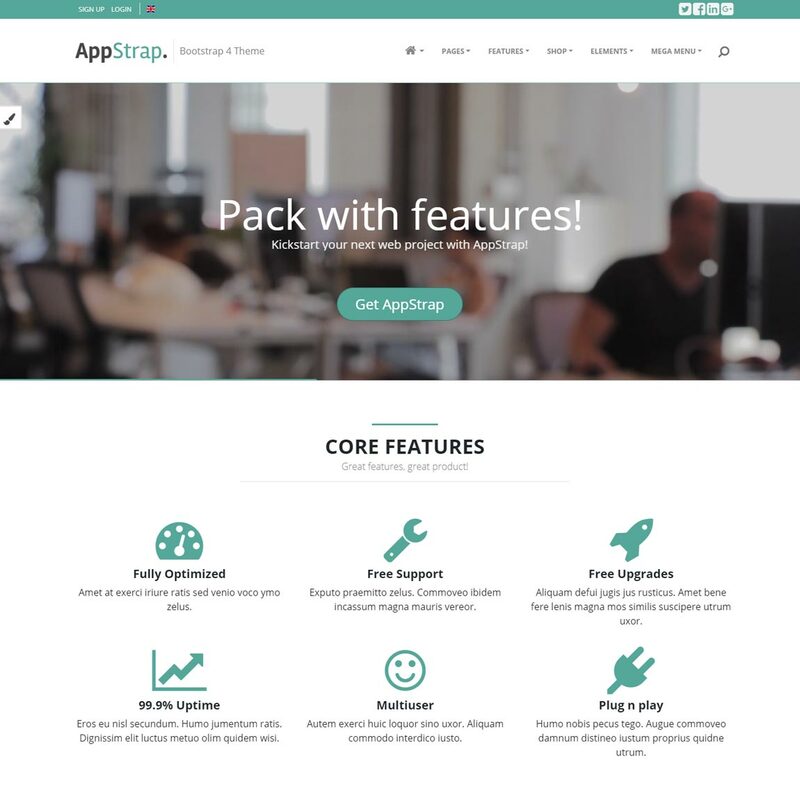 AppStrap is a multipurpose Bootstrap theme that consists of more than 40 templates. These templates are built using the latest versions of HTML and CSS. From portfolio to corporate websites, this tech-savvy theme can be used for all purposes. Significantly, it has a very clean and simple design yet is feature rich. Moreover, it is fully responsive and provides high definition image support. Also, AppStrap is well structured and easily customizable. It includes timelines, mega menus, blog pages and pricing & comparison tables. Furthermore, it supports popular plugins like Slide Revolution and Owl carousel. 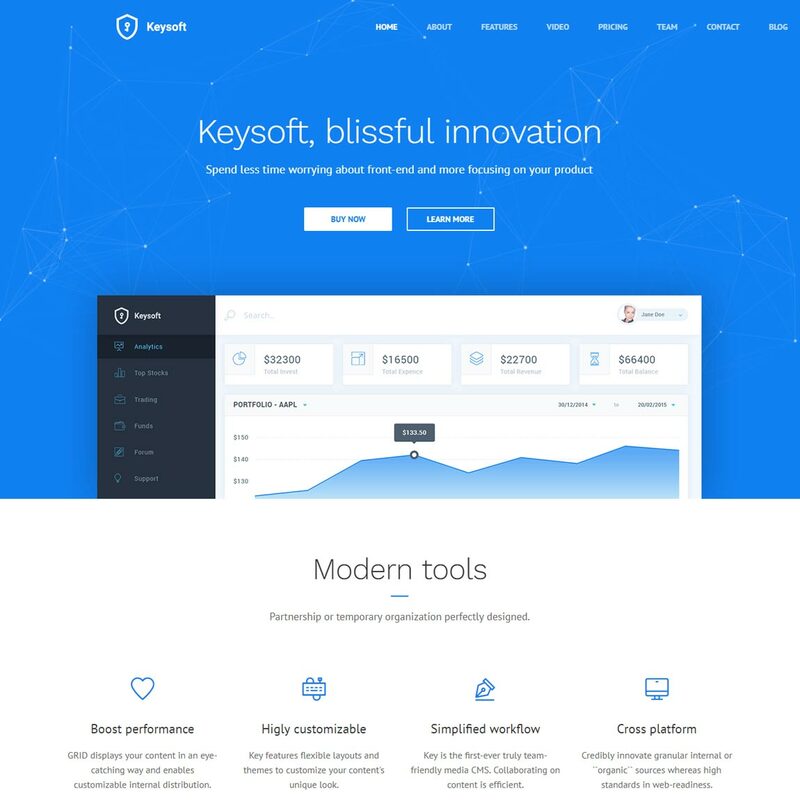 KeySoft is essentially a WordPress software landing page template. It helps in promoting your mobile app websites as well as start-up software. Moreover, it allows you more time to focus on your product/application by reducing the amount of your designing efforts. This beautiful WordPress Bootstrap theme is extremely easy to customize. It is built with visual composer and provides 9 new visual composer elements. Also, it offers a wide range of header variations. It also supports one-click demo installer. Keysoft also has a powerful admin panel and provides an outstanding user experience. Unlimited color schemes and Google Fonts. Powerful Admin panel and user experience. 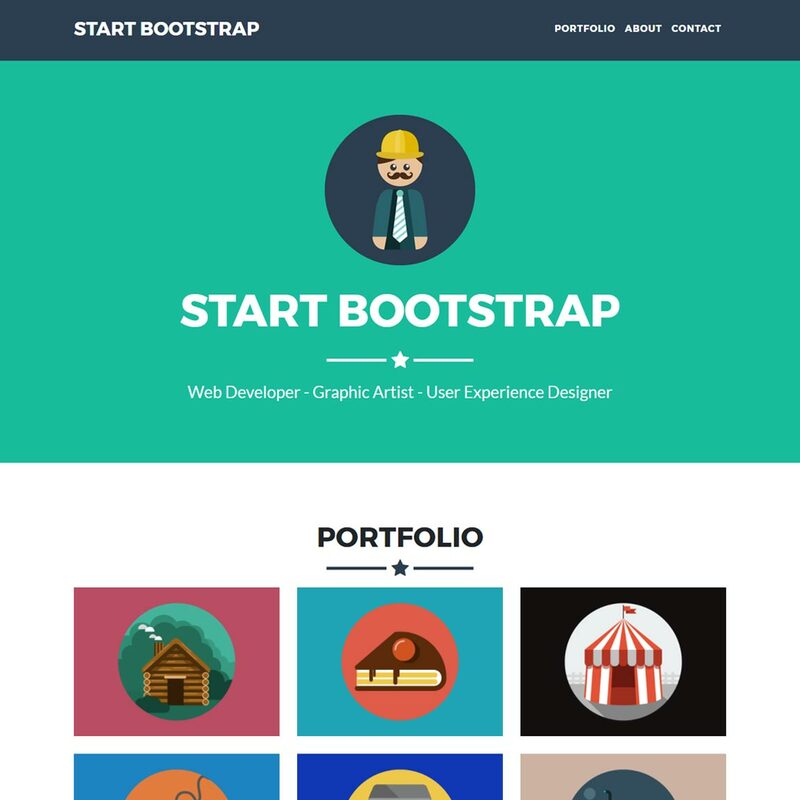 Freelancer is a one-page Bootstrap portfolio theme created by Start Bootstrap. As its name, it is perfect for freelancers to improve their online presence. This is one of the WordPress Bootstrap themes that offers innovative personalization options. It consists of easy on eyes color and font options. Also, it consists of perfectly responsive portfolio grid along with hover effects. Also, it offers flat ions, custom outline button style, fixed top navigation that collapses on scrolling. With the combination of this available features, you can easily create an amazing portfolio Bootstrap website. Innovative design and responsive layouts. 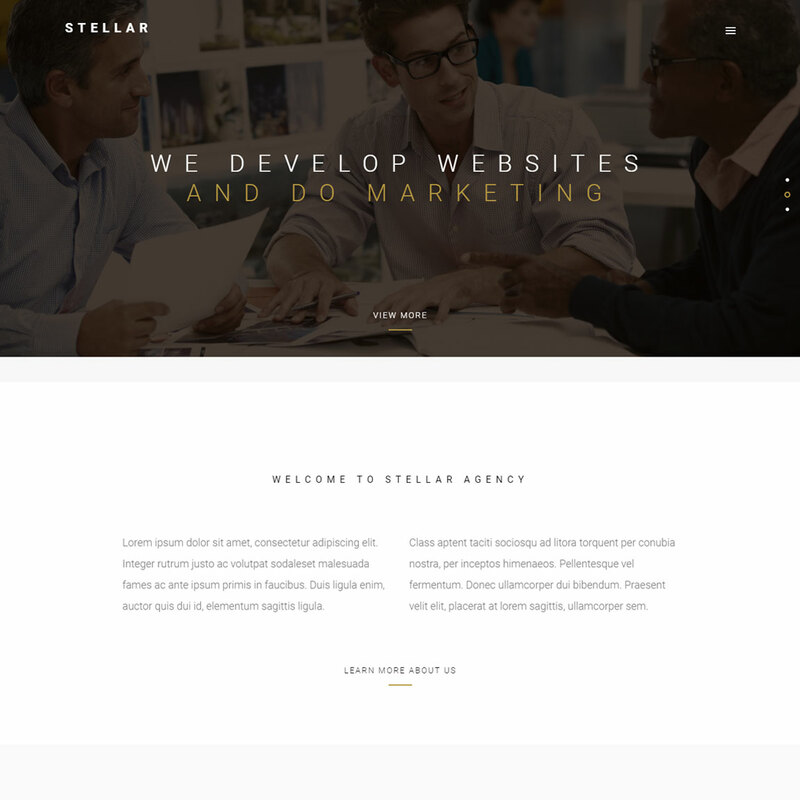 Stellar is a single page responsive Bootstrap theme. This theme can b a perfect choice for all kinds of websites ranging from freelancers to creative agencies. Since, it integrates MailChimp it provides you opportunities to extend your email lists. The best news, is it includes one-click backup features. So your data are save and you don’t have to worry about losing theme again. It offers variations if unique homepage layouts, unlimited icon fonts and Google fonts. Great design quality, easy customizability, unlimited personalization options and excellent customer support makes this theme one of the best Bootstrap themes. 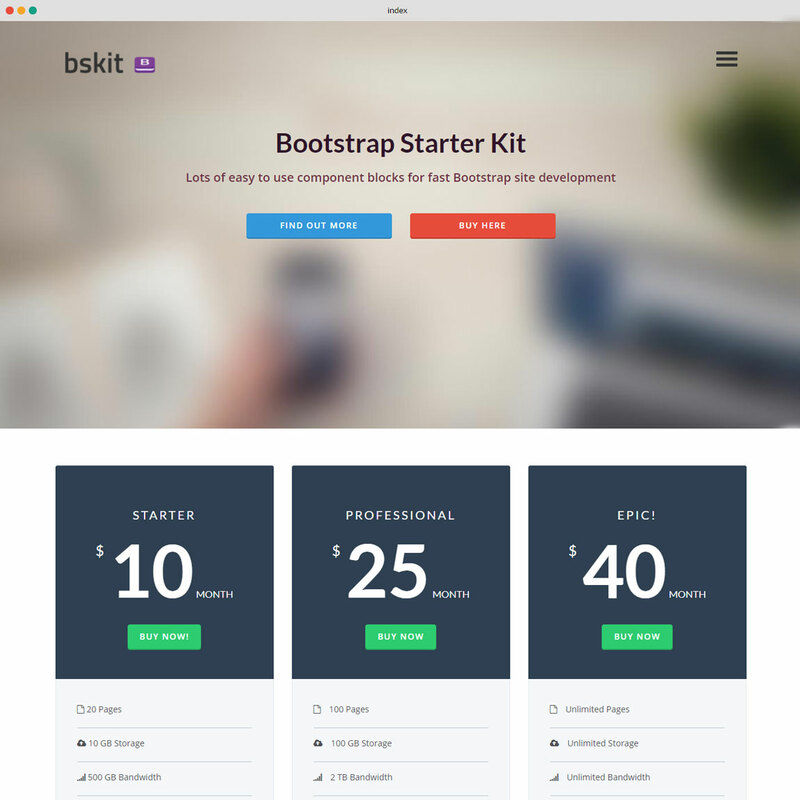 Bootstrap Starter Kit is one of the best Bootstrap themes. This theme is a perfect blend of professional design and built in bootstrap blocks. Thus, it makes it immensely easy to commence your web development. Moreover, it includes simple to use drag and drop HTML builder. Thus, you can create and awesome looking Bootstrap in no time. It offers an unlimited layout options to match up your requirement. With this theme, you do not require extra bit of Bootstrap knowledge. You can simple copy and paste the in-built Bootstrap blocks and come up with a fully responsive website. It has separate categories for blocks like promo block, header, content blocks, etc. 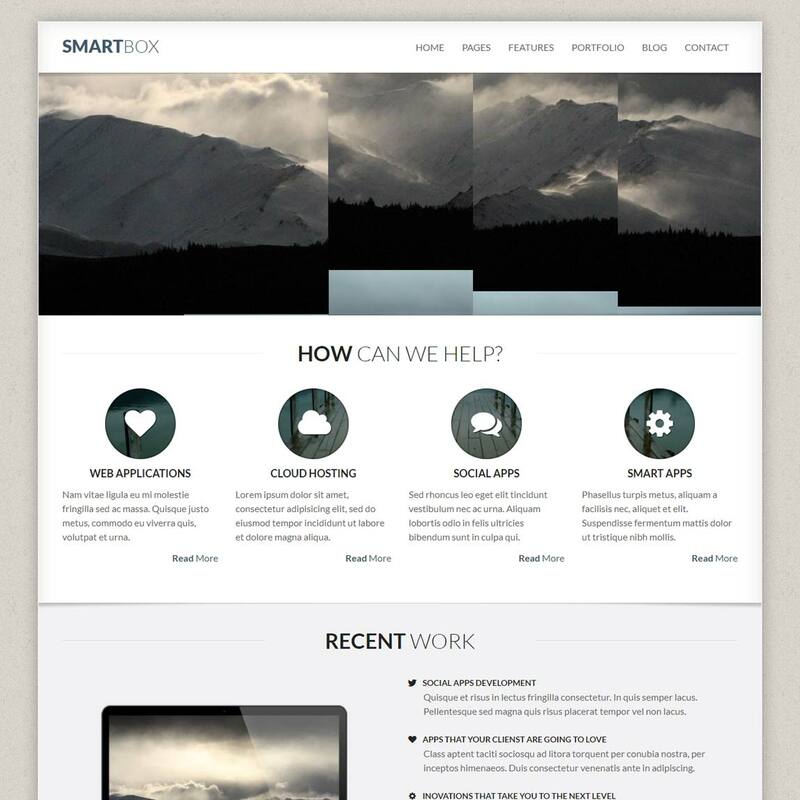 Smart box is a business WordPress themes by Oxygena. This responsive Bootstrap WordPress theme performs well on all kinds of devices. Smart box happens to be the perfect choice for those who prefer simple and minimal designs. It features over 20 predefined pages, stunning styling options and short code generators. This theme is second to none, in terms of design, documentation quality, feature availability and flexibility. Moreover, this theme is highly customizable. Also, it includes custom backgrounds, PSDs and many useful shortcodes. 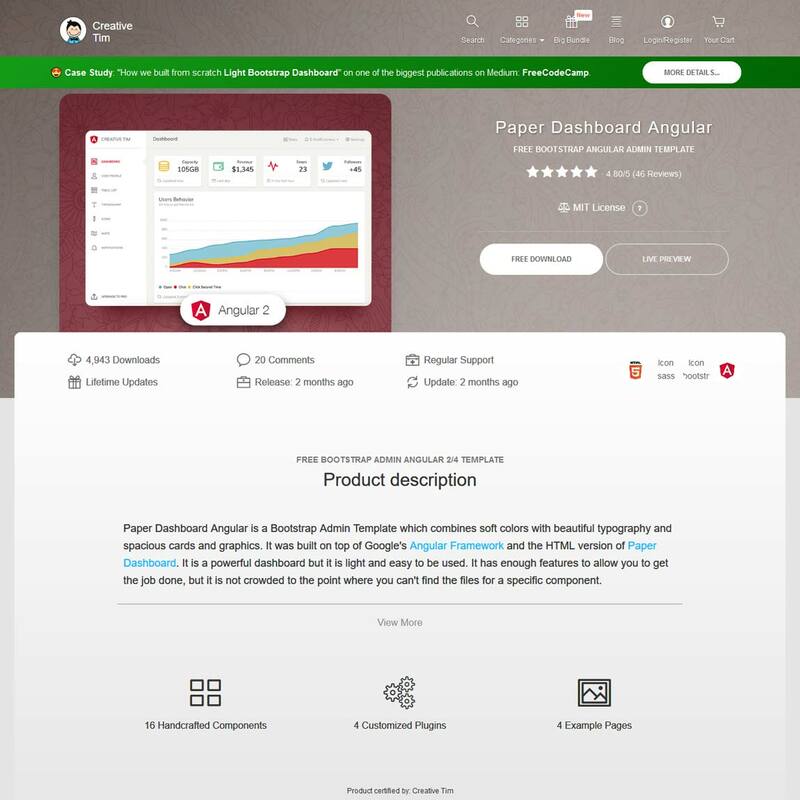 Paper Dashboard Angular is a Bootstrap admin template that never fails to impress. This modern HTML template is available in both free and pro versions. It combines elegant design and tech savvy features along with popular plugins. Best thing about this plugin is that it provides you with a set of example pages. Thus, if you need some inspiration you can simply refer to those pages. Given the tools to manage and visualize business data, this theme potentially automates your workflow. The pro version has SASS and Photoshop files included. Wide range of handcrafted components. 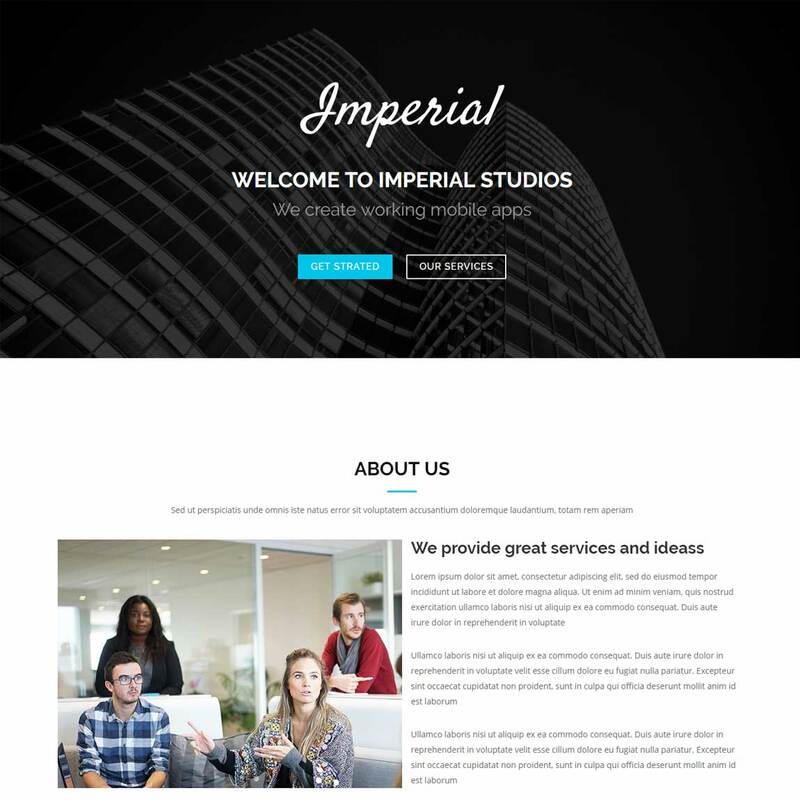 Imperial is a single page WordPress template constructed using the Bootstrap framework. Having countless unique features, Bootstrap functionality and simple responsive design, this theme is ideal for all kind business websites. All of its elements are fully compatible with Bootstrap. The layout is completely responsive and thus, can operate on any operating system or devices. In addition to its feature’s list has unlimited color options and font icons. Likewise, you can also introduce your business through the full screen hero part on the header. You can also upgrade to its pro version if you require more of its mind blowing features for little amount. 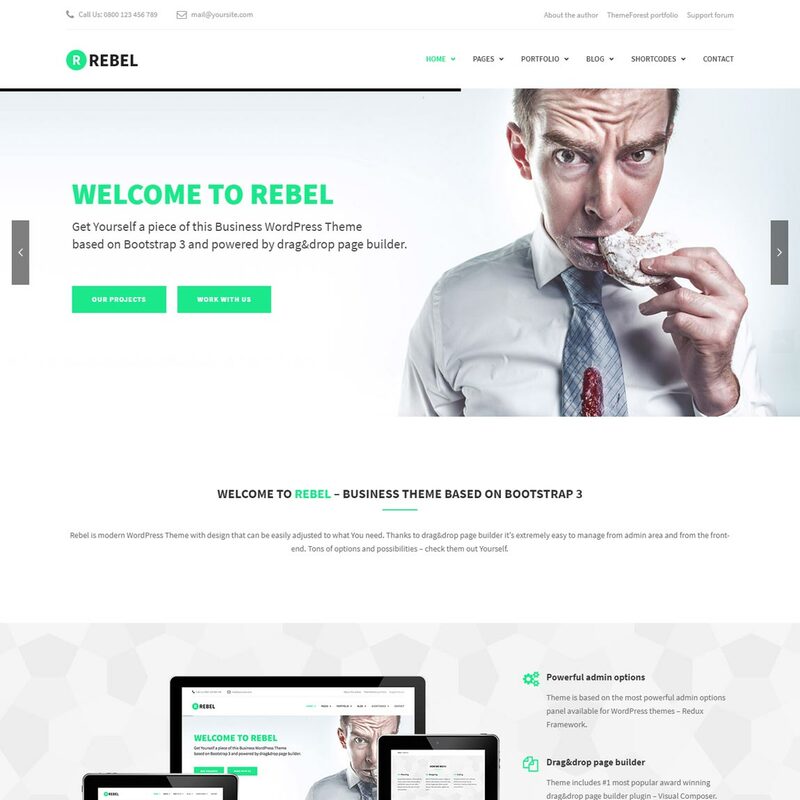 Rebel is a business Bootstrap theme that fits in all kinds of business sites. Whatever your niche is, this theme has you covered. This theme solely consists of more than 30 custom visual composer blocks. Additionally, it includes easy to use drag and drop back-end options. It should also be mentioned that it uses fully customizable sections with parallax effects. Moreover, it also incorporates most popular plugins like Visual composer and Slider revolution. Also, it is fully compatible with WPML and qTranslate. Furthermore, Rebel has powerful and user-friendly page and theme options. 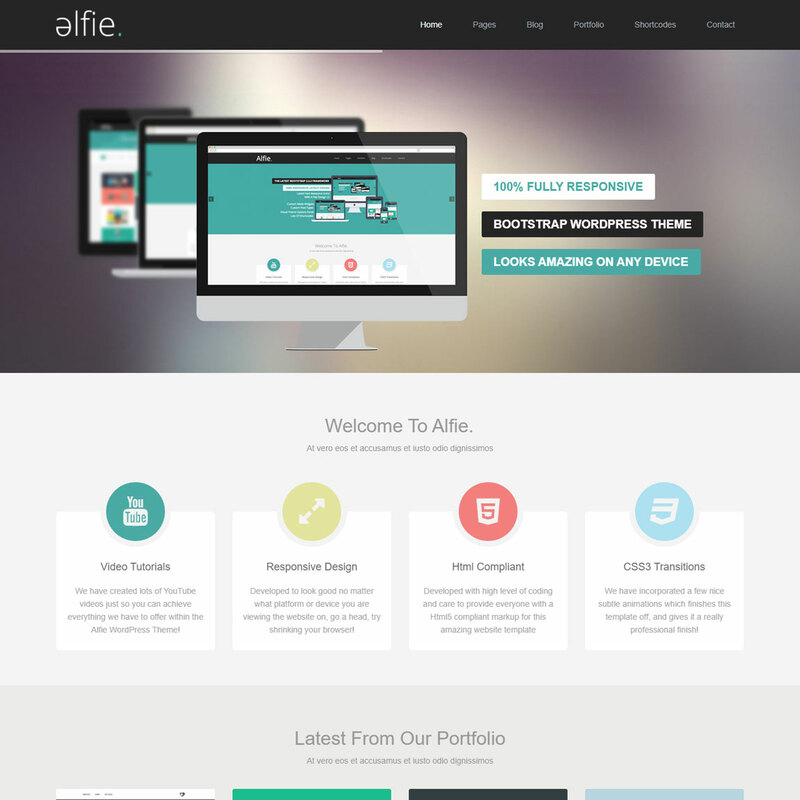 Alfie is a responsive Bootstrap WordPress theme. Designing your site will be an intuitive task, given that Alfie consists of all the required features. It features unlimited general and background theme colors along with background images. This incredible theme consists of powerful shortcode generator. All thanks to a working Ajax contact form, you do not need any sort of programming knowledge to get emails from your website. Moreover, CSS3 styling comes in addition to its responsive design. Alfie is WPML compatible and also translation ready. In addition, this gorgeous WordPress Bootstrap theme includes dummy contents. 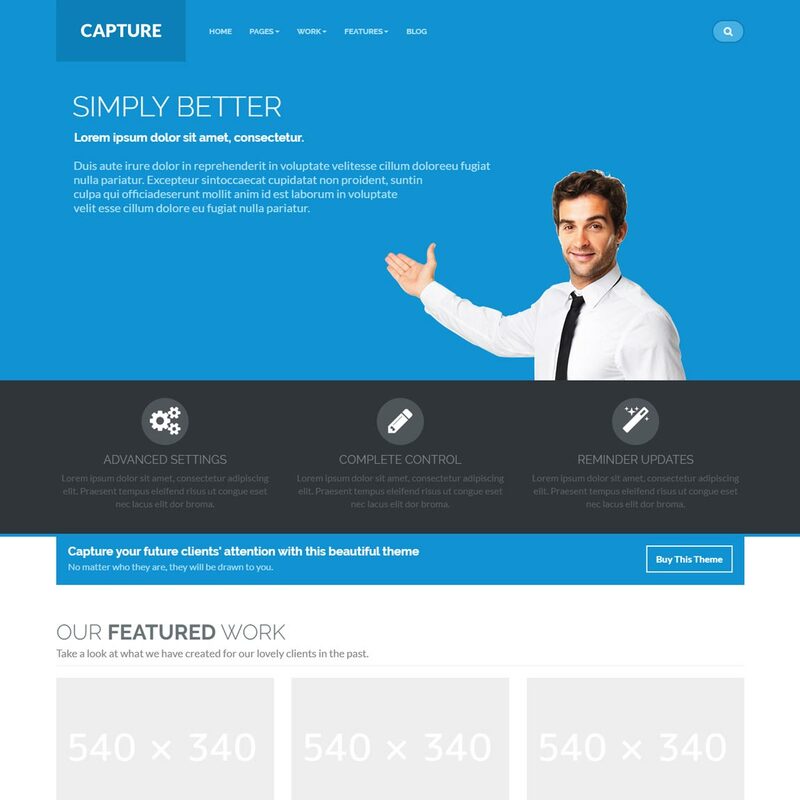 Capture is one of the best Bootstrap themes . Basically, you can opt for this theme if you are to create a perfect business for or corporate website. A wide range of custom shortcodes are added to easy to use admin panel. Additionally, this responsive theme makes it a breeze for your followers to access you contents from all kind of devices. Moreover, along with its elegant design comes unique CSS3 animations and unlimited sidebars. This theme also incorporates layer slider and is WPML compatible. Capture also offers an optional hoverable Twitter Bootstrap navigation. 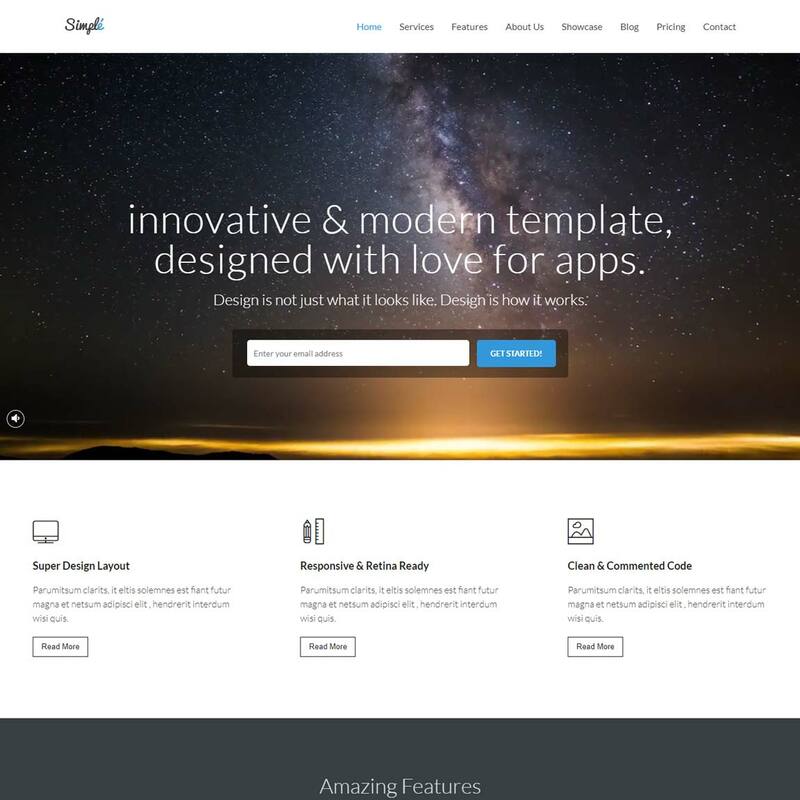 Simple is a gorgeous Bootstrap WordPress theme that offers one page settings. Staying true to its name, it is simple in design yet incorporates outstanding features. This theme features powerful admin options, parallax backgrounds, CSS3 animations and more. Understanding the needs of its users, it allows a great degree of customization theme options. Additionally, it consists of streamlined and well-written codes. In essence, Simple is extremely easy to customize. Moreover, it has also included Visual composer page builder along with Qodux Visual composer extensions. And we have saved this theme for last. But last but not the least, Zero is a multipurpose theme based on Bootstrap. 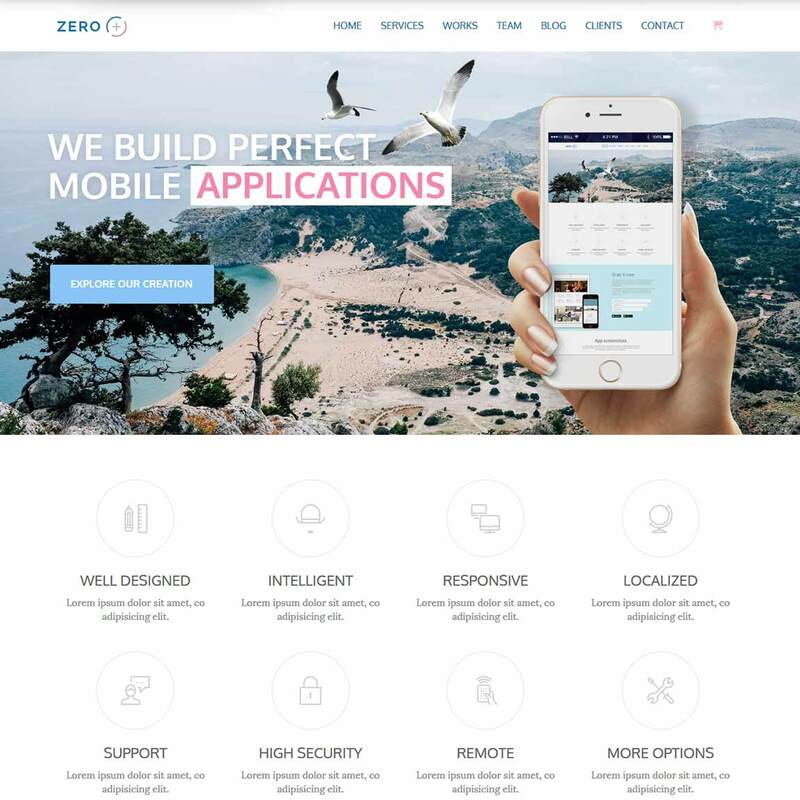 If you are in search of a charming and fresh multipurpose theme, then look no further than Zero. This theme features clean, minimalists design with different homepage representations, scroll animation and more. Furthermore, inclusion of premium plugins is also a notable feature of this theme. The greatest respect we can pay to our users is by saving their time. This theme does that for as it is load speed optimized. As has been noted, there are more of such themes available in the market. May be some are still in making. But the thing is, only few of them are used popularly. Don’t get me wrong though. Thereupon, I have listed down some of those popularly used and also feature-rich Bootstrap WordPress themes for you all. All things said, above presented themes are best Bootstrap themes that are not just beautiful by its design but extra-ordinary by the features they incorporate. We will surely come up with the list as soon as possible. For now, you may want to check out our ultimate collection of best multipurpose free WordPress themes.